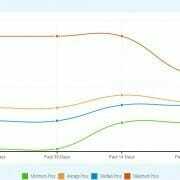 MadBid Goes Crazy – Get Tons of Free Bids! For those of you who love Madbid or if you are thinking of trying it for the first time, today is a great day to go for it. 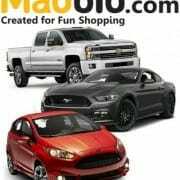 Madbid is having a great credit sale today only. For every package you purchase, you get 3 more of the same package for free. You have until 11:55 p.m. ET today – June 12, 2014 – to take advantage of this sale. There are some great items coming up for auction on Madbid today to bid on with your new credits. You will find everything from a Canon Powershot ELPH 160, to an ACER Aspire V3-572 15.6” Laptop, to a August SE50 Bluetooth Speaker System with FM Radio -Wireless Hi-Fi. You will also find watches, razors, coffee makers, and rechargeable battery packs, just to name a few. And a number of today’s auctions are in the under $100 range. So if you are getting low on credits or thinking about trying out Madbid for the first time, today might be your lucky day. Of course, don’t forget to have Bid-Ninja by your side (get it free here) to let you know who else is bidding, how many other auctions are they bidding on, how much they have spent on the auction, etc. Don’t forget that even if you do not win the item that you are bidding on, you get a dollar for dollar earned discount. This means that if, for example, you use 2 credits to bid on an auction that you do not ultimately win, that $1.20 (60 cents per credit) is put into your “earned discount” account. You have one year from the time the discount is earned to use it towards an auction item at the buy it now price. Your earned discounts accumulate of course and may be combined for a big savings on one item. So in reality, Madbid is a no risk proposition. Even if you do not win the auction – you get your money back to use to buy that item or any other Madbid item! Good luck to you of the Madbid bidders out there! Please let us know your success stories. https://www.bid-ninja.com/wp-content/uploads/2015/06/madbid-3750-credits.png 100 145 Bid-Ninja https://bid-ninja.com/wp-content/uploads/2017/08/bn_logo300x50-300x50.png Bid-Ninja2015-06-12 15:21:412015-06-12 15:22:53MadBid Goes Crazy - Get Tons of Free Bids! 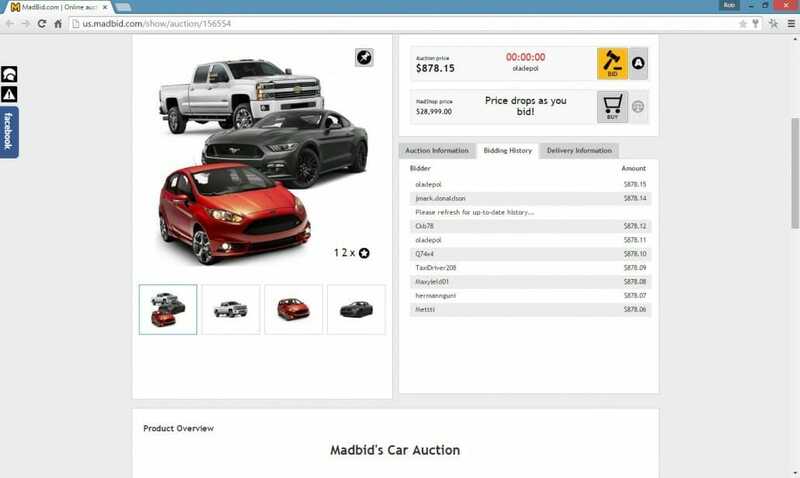 MadBid is Auctioning Off a Brand New Car Right Now! MadBid is auctioning off a brand new car right now! As of this moment the brand new car they’re auctioning off (valued at $28,999) is at a selling price of $877…could you even imagine? Well folks, somebody has to win, and the best part is that you can use the Bid-Ninja software on MadBid free (get it here). As we’ve explained on our blog before, MadBid is arguably the largest penny auction site currently in existence. They’ve just recently come to the US and have made a huge impact on the penny auction community with their exceptional reputation and customer service. They have a unique business model in that they put all the bids you spend on auctions you haven’t won into your own personal “kitty” so to speak, called the “earned auction discount”. So if you spend $20 in bidspend on one auction you don’t win, another $20 on another auction you don’t win and then $20 on another auction you don’t win, you now have a total of $60 in “earned auction discount” that you can either apply to the next auction you bid on OR spend at your leisure in their online store. That model really makes their site a no risk proposition for a would be penny auction bidder, and it is that business model combined with their stellar reputation that will quickly make them the US penny auction powerhouse to mess with. https://www.bid-ninja.com/wp-content/uploads/2015/04/madbid-new-car.jpg 479 400 Bid-Ninja https://bid-ninja.com/wp-content/uploads/2017/08/bn_logo300x50-300x50.png Bid-Ninja2015-04-29 14:44:072015-04-29 14:44:07MadBid is Auctioning Off a Brand New Car Right Now! 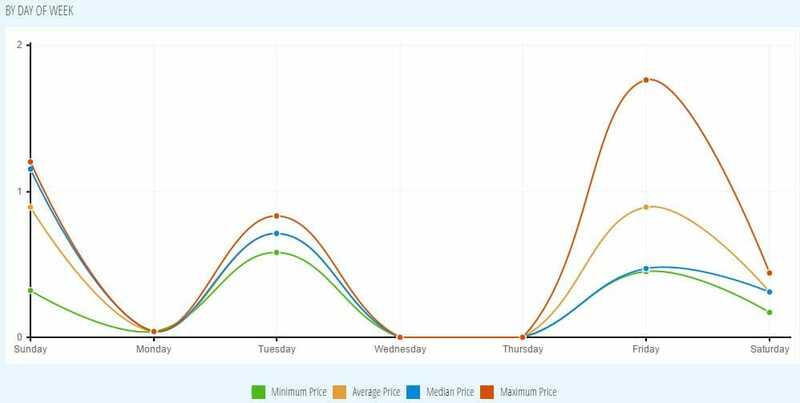 Once again Bid-Ninja has great news for our thousands and thousands of users…our MadBid statistics for all MadBid auctions, products & bidders are now searchable and viewable right on the Bid-Ninja website! That’s right, now you can search our MadBid statistics database for usernames, auction ID’s or even products you’re interested in bidding on so you’re armed with the information you need to slice through your competition. https://www.bid-ninja.com/wp-content/uploads/2014/12/trending.jpg 501 1013 Bid-Ninja https://bid-ninja.com/wp-content/uploads/2017/08/bn_logo300x50-300x50.png Bid-Ninja2015-04-20 17:22:112015-04-20 17:23:59MadBid Statistics for All Auctions, Bidders & Products are Searchable & Onsite Now!